This is an ongoing project that was completed last year. The garden is on heavy clay. My clients wanted to terrace the large sloped lawn area, include a pool and pool house in the design and have lots of planting. The garden needed to respect the beautiful view to the surrounding trees and countryside too. 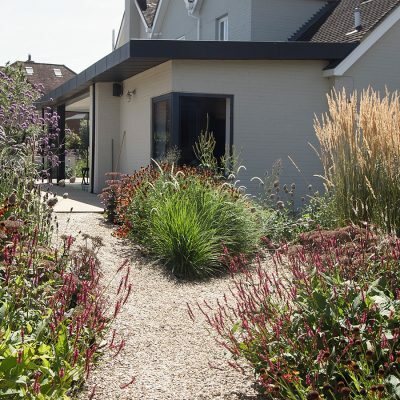 The garden can be split into 4 main areas. 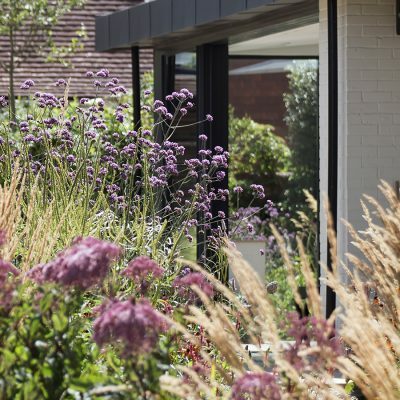 Large front garden with ample parking, formal side garden with cottage style planting and large pergola, pool garden with dining under dappled shade and terraced lawn area and patio by the house. 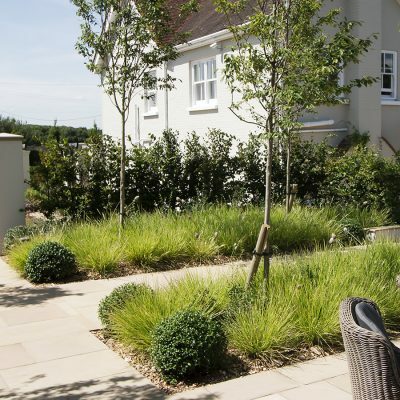 The gravel parking area and house are softened with generous flowerbeds and tiered hedging of box and yew. The hornbeam trees and Portuguese laurel hedging will screen the house from the road and provide some shelter from the wind. 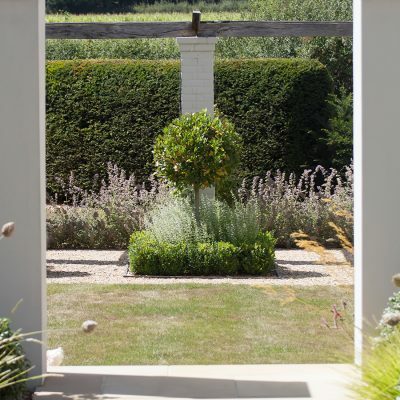 The formal side garden is enclosed on all sides by the house, large wisteria pergola, quercus ilex pleaching and the raised pool garden. This creates a sheltered environment (for this garden!) Topiary and perennial planting surround a formal lawn. The pool garden. My clients wanted some dappled shade for outside eating. This was created with a double line of Amelanchier trees. Their light canopies will also filter the wind to the pool area. 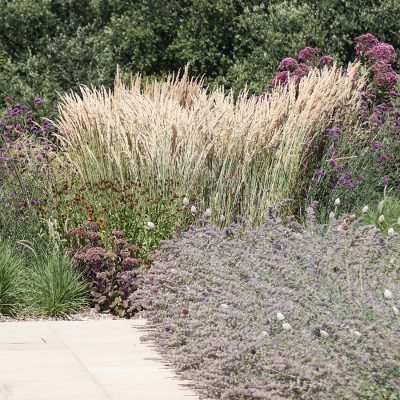 They are underplanted with sesleria grasses and osmanthus. 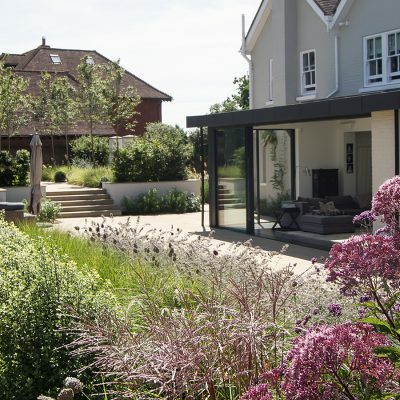 The lawns are now terraced and a large patio is positioned to appreciate the view. 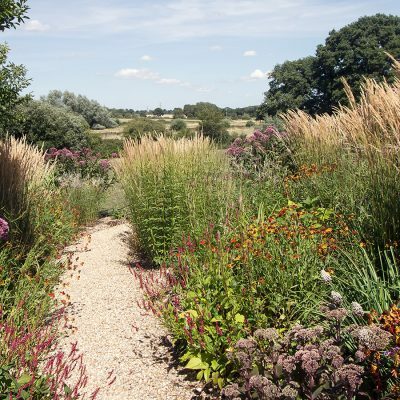 Generous grass and perennial borders lead you towards the best view and the rest of the garden. 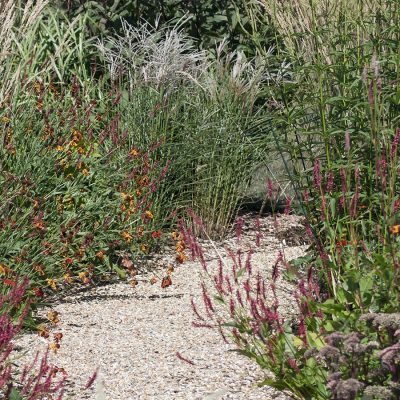 This large country garden is on heavy clay. My clients wanted to terrace the large sloped lawn area, include a pool and pool house in the design and have lots of planting. 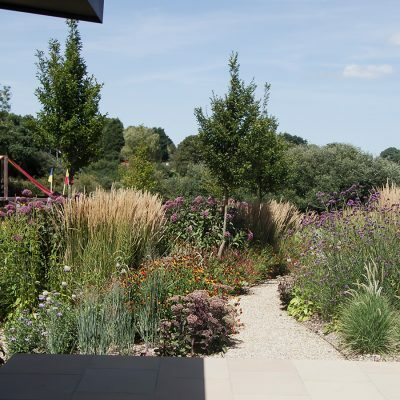 The garden needed to respect the beautiful view to the surrounding trees and countryside too.